Protect your stock and staff from accidental injury or damage. 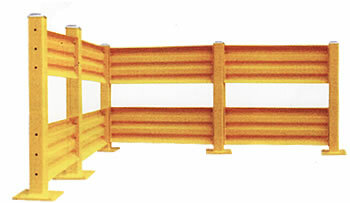 Ideal safety barriers to close in machinery and to divide trucks, forklifts from safety areas and potential risk areas. Easy disassembly, assembly & installation. Triple Ridge provides more strength & rigidity. Rolled Top & Bottom Edges eliminate sharp edges. Four rail lengths & two post heights allow customised assemblies for individual plant needs. Posts are made of 4" square steel tube 1/4” thick & are welded to 10" square floor plates. Includes Bolts & Dyna Bolts.